Art Prof Lessons in the New York Times! 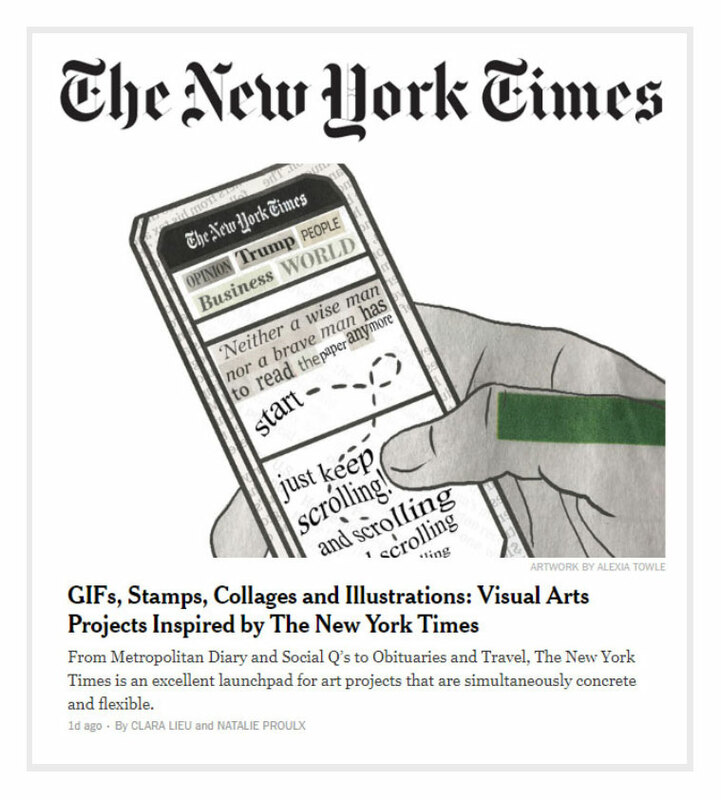 Last week the Learning Network at the New York Times published an article highlighting 8 of our Project Ideas and video tutorials, all inspired by different sections of the New York Times. The lessons included Obituary Collages, Traditional/Digital Editorial Illustrations, Travel Postmark Stamps, Cooking Illustrations, Social Q’s Gif Animations, Metropolitan Diary Pen Illustrations, and Paper Trail Collages. From conception to publication, this article took about 1 year of work, and boy did it take a village! On top of our staff of Teaching Artists, we had Guest Teaching Artists like Caffrey Fielding and Cat Huang featured in the accompanying tutorials, we had a team of wonderful Project Assistants and Interns including Roshan Antia, Cindy Qiao, Ruth Lee, Alexia Towle, Anya Chen, and Clarisse Angkasa who created excellent project examples with written statements to explain their creative process. Managing a team of so many artists is always challenging, the organizational logistics, making sure everyone is one track, and so much more is enough to make your head spin. Before Art Prof I had zero experience managing a team; I’ve been in a brick and mortar classroom my entire life where it really is a solo effort as the professor teaching the course. Everything I’ve learned about managing a team has been learned on the spot, which means a LOT of falling on your face and apologizing for your own stupid mistakes. Despite those challenges, and months of work to get to this point, there’s nothing like seeing an article like this in print! 0 responses on "Art Prof Lessons in the New York Times!"